Whilst clearing out the playroom (a Sisyphean task that makes me want to hunt down the manufacturer of Happy Meals and insert a Pokemon where the sun doesn’t shine), I stumbled across a poster EldestGirl had made. Very often she sequesters herself away in the playroom, writing correspondence to her friends, designing toys out of paper (something else for me to feel guilty about throwing away six weeks later, once it’s been forgotten) or writing her diary. 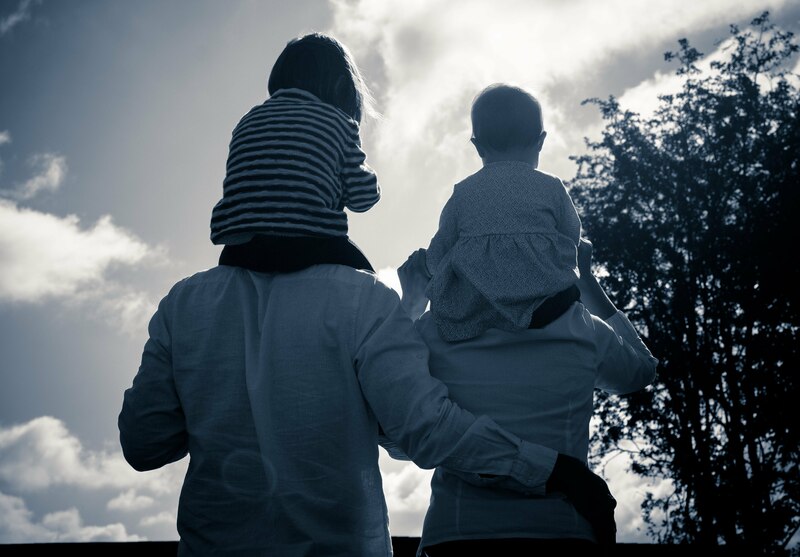 We tend to leave her to it, as we follow the Harry Potter school of child-rearing – Draco Dormiens Nunquam Titillandus. Basically, if she’s not actively asking for our input, we leave her to it. 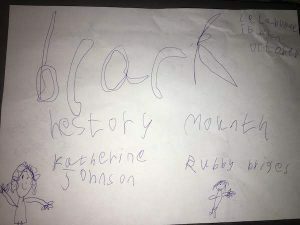 During one of these periods of solitude, unbeknownst to me, she had produced a poster for Black History Month. To illustrate her efforts, she had drawn pictures of Ruby Bridges and Katherine Johnson. I was so smug. 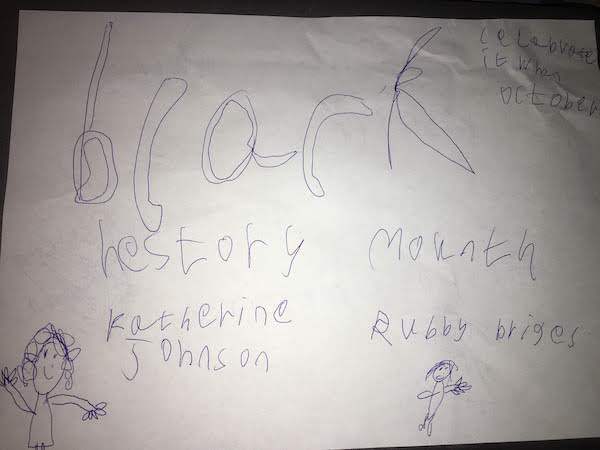 I had made extra effort over the summer to buy her a children’s book about Katherine Johnson, and to show her the news footage of Ruby Bridges. Clearly it had made an impact on her. I mean, yes we could do some tweaking of the spelling, as she managed to spell more than 50% of the words incorrectly, but you know, the effort was there, and her meaning was perfectly clear. This is a precious thing she has done and she is obviously a child to be unequivocally proud of. As I held my daughter’s beautiful, inclusive artwork to the light in orde r to show TheBloke™, I noticed something on the rear side of the picture. I flipped it over. 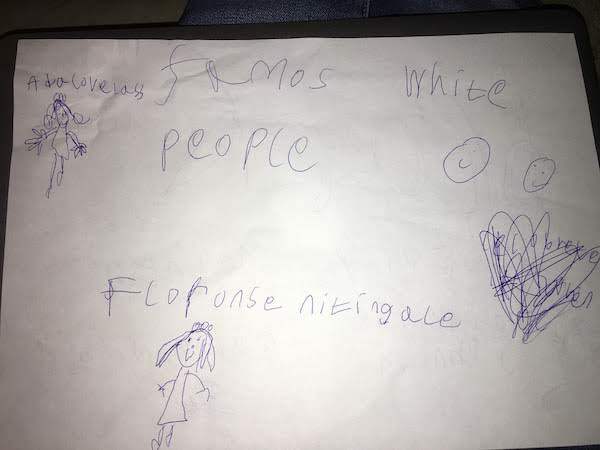 This was the point my smugness faded as I realised my daughter had apparently produced some Aryan propaganda, apparently, and we were instructed to celebrate “Famos White People”. Notably, she had tried to write “Celebrate when it’s…” before scribbling it out after probably realising that white history is vastly predominant for the other eleven months of the year. 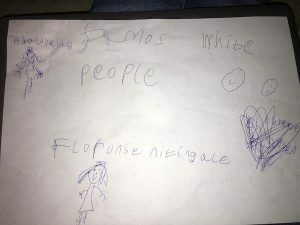 Despite her slightly worrying edict, she still got some feminist points for having chosen Florence Nightingale and Ada Lovelace for her “Famos White People”, which is a relief to a certain extent, as if she had chosen Nigel Farage and Joseph Goebbels, we may be having a different conversation.